U.S. Economy Grew At A 3.5 Percent Rate In 3rd Quarter That's slower than the second quarter's blockbuster 4.2 percent but puts the economy on pace for the fastest annual growth in 13 years. 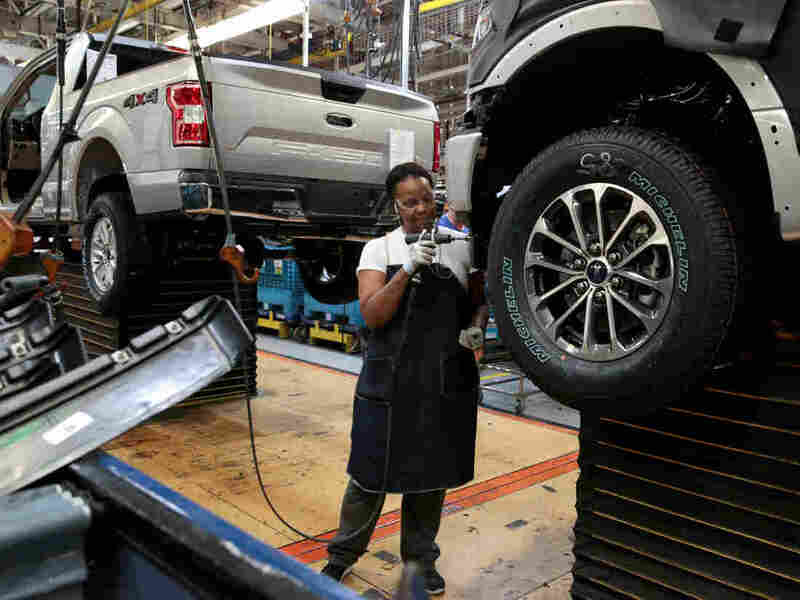 A Ford F-150 pickup is assembled at a plant in Dearborn, Mich., on Sept. 27. The economy expanded at a 3.5 percent rate in the third quarter. The economy expanded at a 3.5 percent annual rate in the third quarter, the Commerce Department said Friday. That's slower than the second quarter's blockbuster 4.2 percent, but it puts the economy on pace for the fastest annual growth in 13 years. Private analysts had estimated a 3.4 percent growth rate in gross domestic product for the third quarter. Consumer spending jumped at a 4 percent rate in the July-September quarter — the fastest in about four years and topping the 3.8 percent in the prior three months. Former White House economist Jared Bernstein said the strong showing reflects the fact that so many people are in the job market. "Lots of people are working and drawing paychecks," he said. "Even if those paychecks aren't growing as fast as we might like, that's going to fuel economic growth and in this report, in fact, the strongest sector was consumer spending." The travel industry was one sector that benefited from that increased spending. "We set records around Labor Day and Memorial Day this year and Fourth of July in terms of travel, and so they're spending more for trips and they're spending more with us," said Elie Maalouf, Americas CEO of IHG, the hotel group that owns Holiday Inn and other chains. Overall growth may have been affected, in part, by Hurricane Florence, which flooded the Southeast U.S. in September. The Commerce Department said Florence resulted in losses of $37 billion in property and equipment. Earlier, Moody's Analytics estimated the economic cost of the storm at $38 billion to $50 billion. And Hurricane Michael, which plowed through the Florida Panhandle and Georgia earlier this month, could affect fourth-quarter GDP. Last month, the Federal Reserve boosted its growth projection to 3.1 percent for 2018, but it saw growth slowing to 2.5 percent next year. The economy has been expanding in the 2 percent range in the past few years, but growth spiked in the second quarter, boosted by consumer spending and exports. But exports decreased at a 3.5 percent pace in the third quarter after jumping 9.3 percent in the second quarter. Analysts had cautioned that the previous increase in exports was sparked by looming tariffs by China in its ongoing trade war with the United States. So they said that the export boom probably would not be sustained. With unemployment at nearly 50-year lows, consumers have been confident enough to spend. The Conference Board's measure of consumer confidence rose in September and retail sales grew 4.7 percent last month from a year earlier. But the housing market is starting to slow, amid higher interest rates. Sales of new homes fell 5.5 percent in September — the fourth monthly drop in a row — and resales were down 3.4 percent. The Fed has been raising interest rates as the economy continues to recover from the Great Recession. Rates on 30-year fixed-rate mortgages are approaching 5 percent, which may discourage some homebuying. NPR's Jim Zarroli contributed to this report.